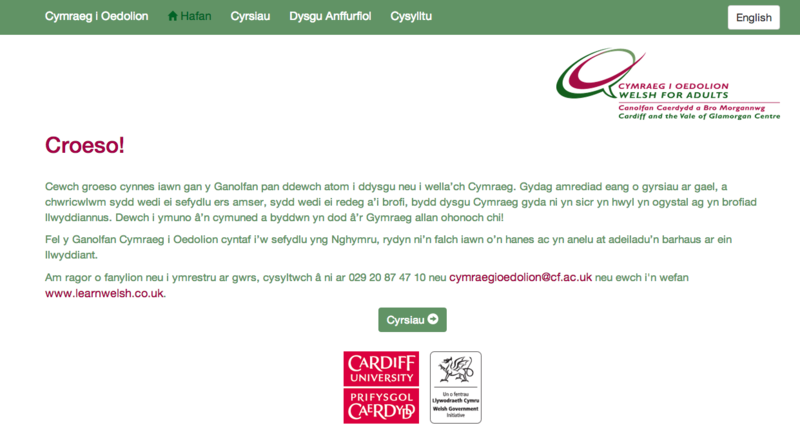 During my time at Cardiff University I created a mobile web application for Welsh for Adults. The purpose of this web app is to give users a free taster, a brief introduction at Welsh for Adults and try to persuade them to sign up for courses. Later in the year I was then asked to improve the application by adding new courses, games and a contact form. I have finished the updated version of the mobile web application which is available at m.welshforadults.cardiff.ac.uk. You can download the iOS app from the App Store and the Android app from the Google Play Store. Stuart Jones has been responsible for designing and developing a bilingual app for adult learners of Welsh which will work on all smart phones and tablets. As part of the app, he has developed search tools to find the latest course information, games to practise vocabulary and contact forms. The app links to information from our website, google calendars, and other databases. When designing the app, Stuart kept the Welsh for Adults brand in mind. His design is not only in line with our strict branding guidelines, but also easy to use. Stuart has worked in a timely manner and with excellent communication skills. He has been friendly, knowledgeable and kept us informed with what was being done throughout the project via emails and meetings. When technical problems arose, Stuart was able to resolve them quickly. He has provided technical advice and also helped with testing to ensure that the app was developed correctly. I am delighted with the work completed and would be pleased to recommend Stuart for similar projects in the future.